This is our Ylang Ylang Extra Steam Distilled Essential Oil. Herbal Folk Traditional uses for Ylang Ylang Extra include an ingredient in ointment for the hair, skin disease treatments, prevent fever, fight infections and soothe insect bites. Ylang Ylang Extra, steam distilled from its amazingly fragrant flowers, is one of my favorite essential oils. So much so that I carry a bottle of it in my purse since I first started using it in the early 1990's! It has many dimensions to its intensely sweet, soft, floral-balsamic, slightly spicy scent in addition to its bright, extremely delicate top notes. Ylang Ylang Extra blends well with Ambrette, Amyris, Basil, Bergamot, Black Currant Bud, Black Pepper, Carnation, Cardamom, Cassie, Cedarwood, Cinnamon, Citronella, Clary Sage, Clove, Coriander, Frankincense, Galbanum, Geranium, Ginger, Grapefruit, Hay, Helichrysum, Jasmine, Lavender, Lemon, Lemon Eucalyptus, Lime, Liquidambar*, Litsea Cubeba, Mandarin, Melissa, Mimosa, Neroli, Nutmeg, Oakmoss, Orange Blossom, Orris, Opopanax, Palmarosa, Patchouli, Peru Balsam, Petitgrain, Rose, Rosewood, Sandalwood, Spikenard, Sweet Orange, Tangerine, Tonka Bean, Tuberose, Vanilla, Verbena, Vetiver and Yuzu. *Liquidamber, also known as Lu Lu Tong, is an herb that is also used in Traditional Chinese Medicine whose name means "all roads open". In TCM one of Liquidamber's applications is to open the Fallopian tubes when this is a cause for a woman's inability to conceive. It's no wonder that these two essential oils work synergistically to encourage fertility. Ylang Ylang Extra Essential Oil is native to tropical Asia especially Indonesia as well as the Philippines. Madagascar, Reunion and the Comoro Islands are its major oil producers. 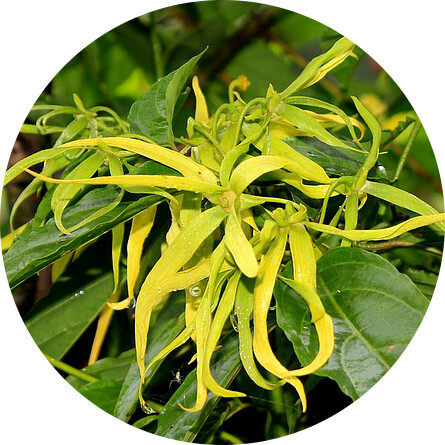 Ylang Ylang Extra Essential Oil is used extensively as a fragrance and fixative in cosmetics, perfumes and soaps. Ylang Ylang Extra Essential Oil has the following actions: aphrodisiac, antidepressant, anti-infection, anti-seborrheic, antiseptic, circulatory stimulant, euphoric, hypotensive, nervine, nervous sedative, regulator and tonic.